Purchase here—Paperback, Grayscale Interior Version-$15.99 or Full-Color Version-$20.99. Enter Promo Code discounts. 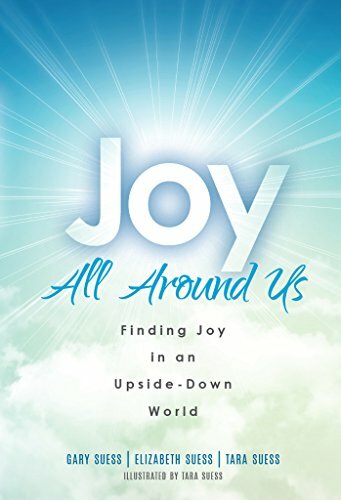 Collaboratively written by a married couple and their daughter, the authors draw from their own respective life journeys to map out the pathway to joy. Each authors’ infectiously joyful point-of-view shines bright with a uniquely different voice, colored and shaped with varying experiences, interests and perspectives. The relatable anecdotes and musings both inspire and entertain, while evoking readers own fond memories and appreciation of personal blessings. The search begins from within by recognizing sources of joy in our life and continues with elevating our ability to influence happiness and joy through our outlook, life choices, and beliefs. The book’s warm and light-hearted tone throughout helps its message to resonate with readers in individually unique and touching ways. With honesty and wisdom, Joy All Around Us teaches us to notice the often overlooked simple pleasures and small moments in life that lead to joy. The authors show us that by being very intentional with our choices, mind-set, and surroundings, we can position ourselves to realize greater levels of happiness and joy. Ultimately, they reveal the true means to further transform our lives and turn these powerfully positive emotions into lasting joy. Overall, Joy All Around Us succeeds in laying out the road map to joy—while managing to entertain and spark feelings of joy along the way! If we desire it, the power to live joyfully can be found within us. Take a peek inside the book by downloading some excerpts.